On President's Day – Feb. 19 this year – we will honor the memory and accomplishments of one of our greatest presidents, Abraham Lincoln. While the myth and legend of this great president has expanded through history, it cannot be forgotten that he began his career as a country lawyer in Illinois. Over the course of his career as an attorney and during his rise as a politician, Lincoln was famous for his wit and simple, yet compelling, way with words. He uttered many famous quotes, some of which are noted below, that can serve as excellent advice even for today's lawyers practicing nearly 150 years after his untimely death. 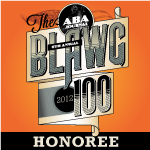 Despite the current negative public perception of lawyers, the practice of law remains one of the noblest of professions. Continuing efforts of all attorneys to do the best they can for their clients and their community not only results in personal fulfillment but also advances the profession as a whole. Good lawyers are not only strong advocates on behalf of their individual clients but may also serve as pillars of the community through volunteer work and pro bono work. Striving to volunteer one's time in this respect to the community is not only a part of being a good lawyer but also serves to foster a positive view of the profession as a whole. It should also be kept in mind that we are not just lawyers. We may also be identified as mothers, fathers, friends, musicians, artists, or sports enthusiasts. An effort to be good in all aspects of life results not only in a sense of accomplishment but also makes for a more fulfilling existence. So the next time you find a heads up penny, in addition to the prospect of good luck, think, "Whatever you are, be a good one." As lawyers, our reputations precede us. Having a character made up of integrity, honesty, or punctuality may cast a shadow just as long and deep as the negative shadow cast by one having an opposite character that is exhibited through a lack of integrity or through dilatory and vexatious conduct. There can be no question that one's reputation will set the stage as to how they are dealt with and viewed by others. In picking up new files and before dealing with an opponent, one's first thought usually turns to the reputation of that other attorney. Many times, if the reputation is not known, it will be sought out by inquiring of others or doing other research in an effort to prepare for handling a file with that opposing counsel. Similarly, in dealings with judges, the "shadow" created by an attorney's reputation will reach the courtroom long before the attorney even stands before the bench on the issue presented. It is often said that a lawyer's word is his bond. This is more than a cliché, it is a principle, a truth, and should be honored as such. Thoroughness in preparation and presentation along with punctuality and courteousness are also important aspects of creating a positive reputation. Adherence to these qualities will only enhance one's reputation within the bar and allow for better representation of the client. Accordingly, it is important to constantly remember that every action may help to expand, or alter, our reputations. Consistent with Lincoln's analogy, when a tree is chopped down, it leaves little or no shadow. As hard as it is to develop a strong, favorable reputation, all it takes is one misstep to diminish, or even totally destroy, that reputation. There is no better lawyer than a fully prepared lawyer. Judges and fellow counsel appreciate nothing more than the prepared lawyer who can streamline and thoroughly, yet concisely, present the client's position. Clients are better served by lawyers who take the time to become fully acquainted with the facts, the law, and the rules of civil procedure before completing whatever legal task lies ahead. Whether it be the simple presentation of a discovery motion or the participation in a lengthy trial, the more time spent in preparation, the better the finished product will be. Additionally, developing a reputation as a well-prepared attorney will earn you the respect of your colleagues, may add to your credibility and will consequently strengthen whatever position you are advocating on behalf of your client. Being in a profession that is adversarial by nature, we often approach issues with a fight in mind as opposed to efforts to reach an amicable resolution. With these words, Lincoln stressed that the role of a lawyer as a counselor is just as important, if not more important, than his or her role as a litigator. Part of being a good lawyer is persuading clients to put emotions aside. Compromise is much more difficult when egos are involved and when attorneys take on emotional trappings of the client. Efforts at an objective evaluation of the pros and cons of any position will always serve the goal of reaching an amicable resolution of any dispute. It is also often said that the sign of a good settlement or resolution is that both parties are not entirely happy with the result but the case is still nevertheless finally resolved. As Lincoln stressed, there is plenty of business to go around as we move from one file to the next and so litigation should not be sought out simply for the sake of litigation. Similar to Michael Corleone's later advice in The Godfather, Part II, "Keep your friends close, but your enemies closer," Lincoln long ago recommended similar action to defuse one's opponents. Lincoln's advice goes a step further and advocates reaching out to one's enemies in an effort to appease them. Lincoln followed this advice when he famously filled his Cabinet seats with his political enemies. By doing so, he kept such enemies close and neutralized them by honoring them with prestigious positions of importance within the control of his administration. In today's practice of law, we are routinely faced with adversarial attorneys we much rather not have to deal with. As difficult as it may be, perhaps it is better method of handling all adversaries by not retaliating in frustration but, wherever possible, greeting such opponents with appeasement or consideration. Regardless of the shoddy treatment you may be receiving from an adversary, respond as you would wish to be treated. Routinely grant extensions or continuances when requested so long as it is not to the detriment of your client. Voluntarily disclose discovery that such opponents may be entitled to without the necessity of formal discovery requests or motions practice. Promptly return phone calls. By acting in a non-confrontational manner towards vexatious opponents, it becomes more and more difficult for such adversaries to continue to respond or litigate in a negative fashion. Additionally, if certain issues eventually come to a head and require court intervention, the court would look more favorably upon your efforts towards an amicable resolution of the issue when compared to the petty and negative conduct of your opponent. At CLE seminars, we often hear judges on the panel spend their presentations expressing the virtues of brevity and giving examples of less than exemplary arguments or presentations presented by attorneys in court. Overburdened judges and bored jurors appreciate concise arguments grounded in common sense and ideals of fairness. The old school of thought of reiterating your argument three times in an effort to engrain your position upon the minds of the jurors no longer seems valid in this day and age of the rapid fire receipt and retention of information. Jurors, who are much more intelligent than they are usually given credit for, may become frustrated and develop a negative view towards you and, consequently, your client if you bore them with an unnecessarily repetitive presentation. Being brief and concise can go a long way in having an impact and leaving a lasting impression upon others. No better example of this can be cited than Lincoln's own brief, concise, yet powerful, Gettysburg Address. Lincoln used less than 300 words delivered in just over two minutes in what has become known as one of the most compelling speeches in American history. Despite being overburdened with attempting to reunite a country divided by civil war and bloodshed, Lincoln remained close to his wife, doted on his children, and otherwise attempted to live his life to the fullest. As difficult as it may sometimes be, it should be kept in mind that the practice of law is but one dimension of our short lives. A balance between work and life outside of work should be sought and encouraged. Focusing one's energy entirely on work may cause one to burn out or become disillusioned with the practice. It will also likely result in significant regret at the end of one's life when looking back at all the missed opportunities to enjoy life outside of work with our family and our friends. Efforts to realize a more healthy and balanced life by spending more quality time with your family and friends, enjoying recreational activities or hobbies, or by developing whatever your potential may be will only serve to add life to your years. Such a well-rounded lifestyle may also result in one becoming a more productive and effective attorney. Daniel E. Cummins is a partner and civil litigator with the Scranton law firm of Foley, Cognetti, Comerford, Cimini & Cummins (http://www.foleycognettilaw.com/). 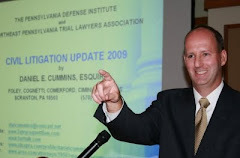 For more background information on Attorney Cummins, see his online profile at http://www.avvo.com/attorneys/18503-pa-daniel-cummins-610885.html. This article is reprinted here, with permission, from the January 29, 2007 issue of the Pennsylvania Law Weekly. (c) 2009 Incisive Media US Properties, LLC. Further duplication without permission is prohibited. All rights reserved. Please contact the author for permission to reprint or duplicate this article.